The exhibition space for “Mutable” at the Piramal Museum of Art. Note the ease of movement between exhibits and the access to view them up close. The only thing I couldn’t really get was the lighting, which made the walls look sickly. I wasn’t sure what the word “Mutable” meant and had to look it up in the dictionary. 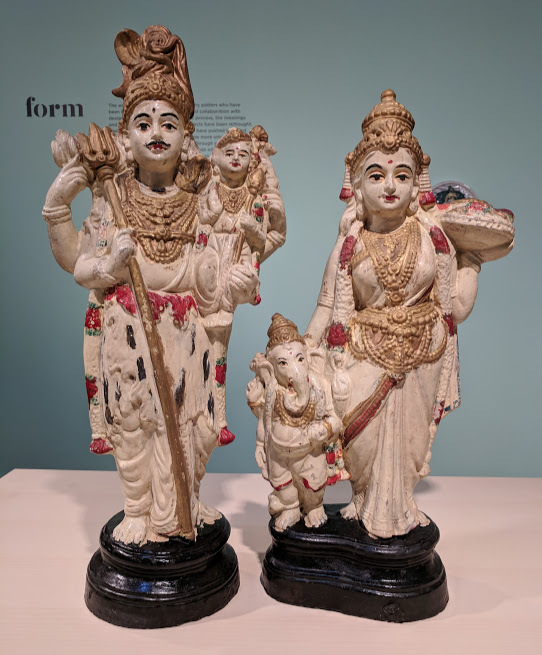 According to the Merriam-Webster Dictionary, it means ‘prone to change’ and in the context of the exhibition it means the changes that have taken place in ceramic and clay art in India over the last 70 years. 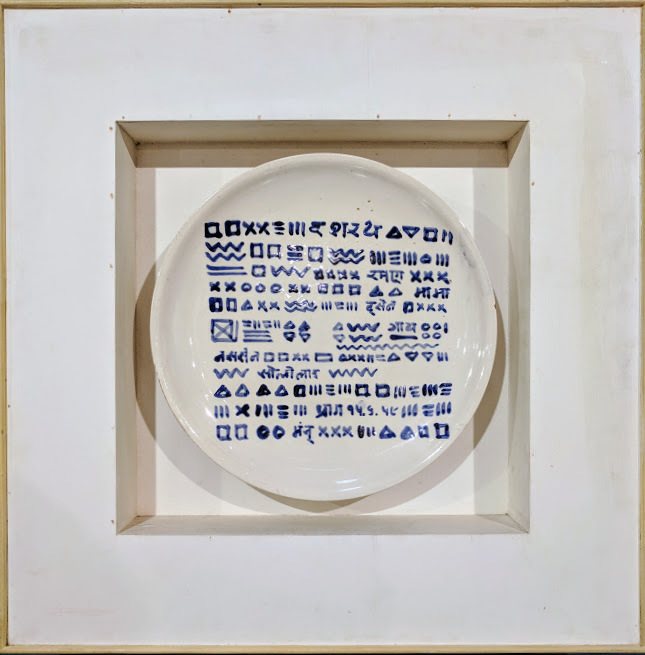 The Mutable exhibition maps this through 5 sections — Shift, Utility, Form, Object and Perception — with each section addressing “diverse practices, and showcases the works of potters, ceramicists and artists” during the creation of a modern and decolonising India. 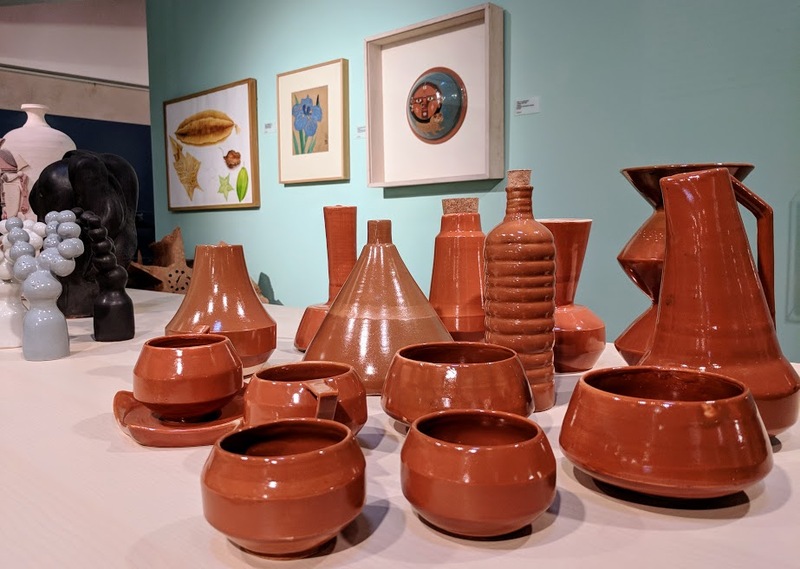 The exhibition also looks at the works made outside “any specific ideological and institutional frame”, and also objects that were created “through collaborations between potters and artists, artists and industry, studio practitioners and hereditary potters, and between organisations and potters”. In brief, the exhibition sought “to record the… history of the art form and its makers and to explore the boundaries that exist between the ‘traditional’ and ‘contemporary'”. I took my time to go through the exhibition, and then going back to see the ones I liked, taking my time to understand make the connections between the exhibits and the word “Mutable”. 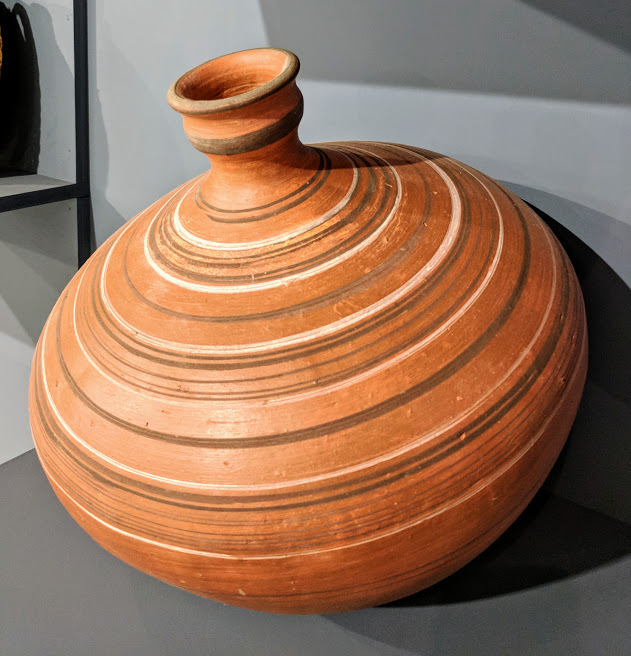 For example, one of the first exhibits I saw was a surahi or a traditional water pot and placed next to it were two modern interpretations of the surahi. Though they looked quite different, they were still recognisable as a surahi. So, while the design had become mutable, its functionality had not. 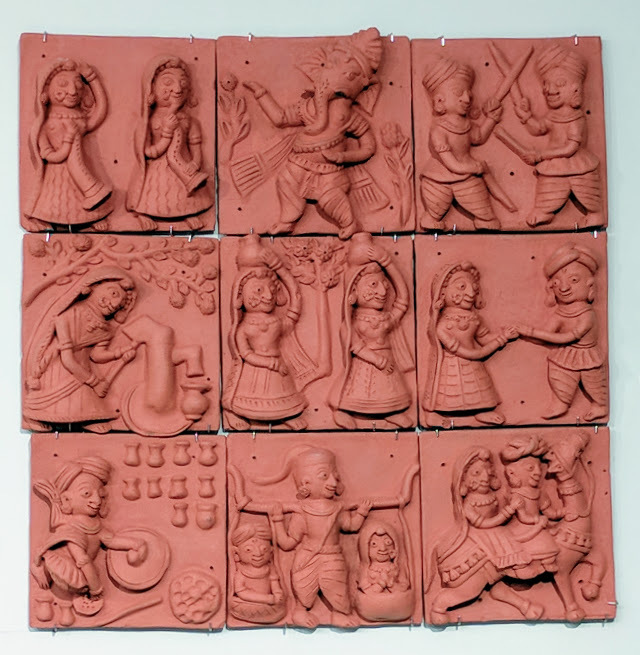 My favourite exhibit was Sudhir Patwardhan’s “Untitled” terracotta work, which at first glance looked like a big slab of pink sandstone. As I looked closer, it revealed surprising details — a tree, and beyond that an undulating landscape. Were undulations mountains or sand dunes? Did the two distinct portions convey a meeting of the traditional and the contemporary? Did this convey the mutable, ever-changing nature of the earth? The terracotta was so compelling that my hands reached out to touch the terracotta slab involuntarily. The ever-watchful security guard cleared his throat loudly and I withdrew my hand guiltily. 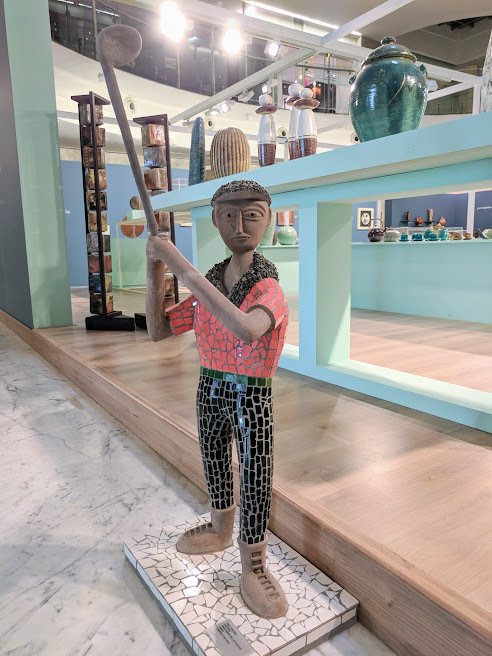 The scope, magnitude and importance of the Mutable exhibition revealed itself much like Sudhir Patwardhan’s untitled terracotta — slowly, bit by bit, sometimes bold and clear, sometimes nuanced and subtle, sometimes filling me with nostalgia and sometimes with wonder. I loved some of the exhibits, liked most, while a few left me indifferent and puzzled. A selection of some of the exhibits that I loved/liked are given below. Untitled by Dashrath Patel. Ceramic, 1959. From the collection of the Dashrath Patel Museum, Alibag. Sinuous forms that look like part gramophone players, part trumpets ! 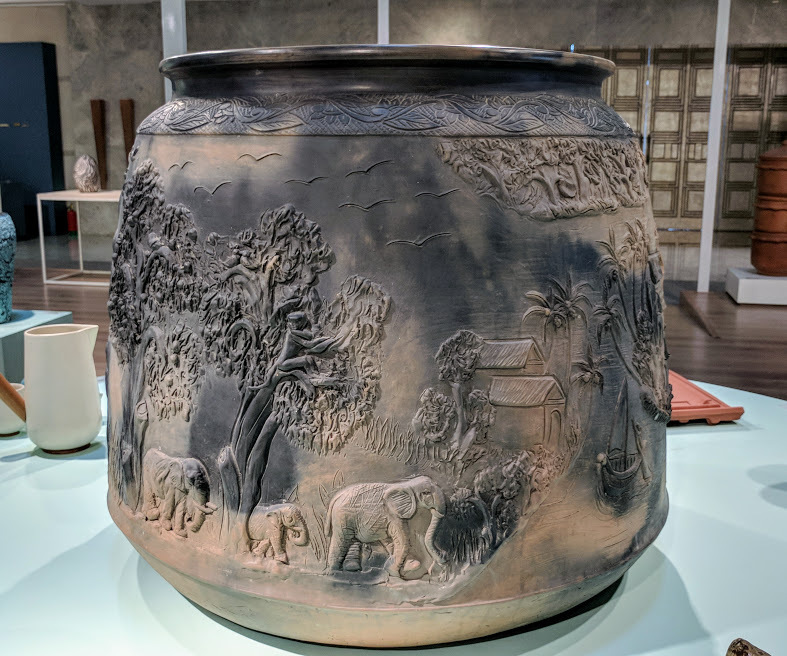 A huge vat with the most interesting details like a monkey reaching for a bunch of bananas, a donkey resting under a tree as his master, a potter, makes pots on a wheel; a herd of elephants and more. 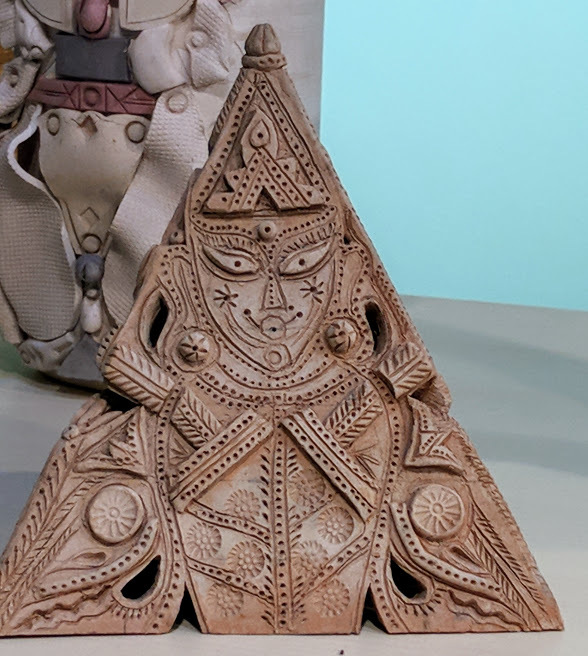 Very recognisable as Devi, but such an unusual design ! Shiva and Parvati with Kartikeya and Ganesha. Navratri Kolu dolls, ca. 1950s. From the collection of the Ashvita Foundation, Chennai. Monuments of Jaipur by Neeraja International. Ca. 1990s. Quartz, Green Glass, Fuller’s Earth, Banyan Tree Gum, and Sodium Sulphate Particles. 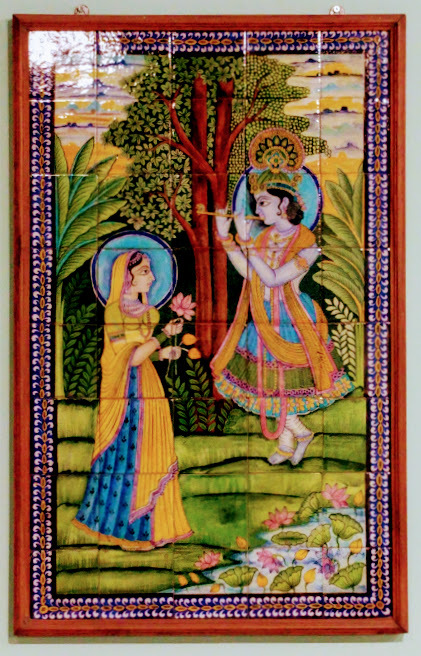 Radha Krishna Tile Panel by Neeraja International. Ca. 1987. Quartz, Green Glass, Fuller’s Earth, Banyan Tree Gum, and Sodium Sulphate Particles. Golf Player by Anuj Saini. Made from waste ceramic tiles iron rods and cement. I left the exhibition in a thoughtful frame of mind and with a lot of questions. I couldn’t help but wonder why such an exhibition has not been thought before. [Or was it that such an exhibition had been held and I missed it?]. I also wonder if the exhibition is a response to the global appreciation for handmade and handcrafted items, even if the focus is on India. 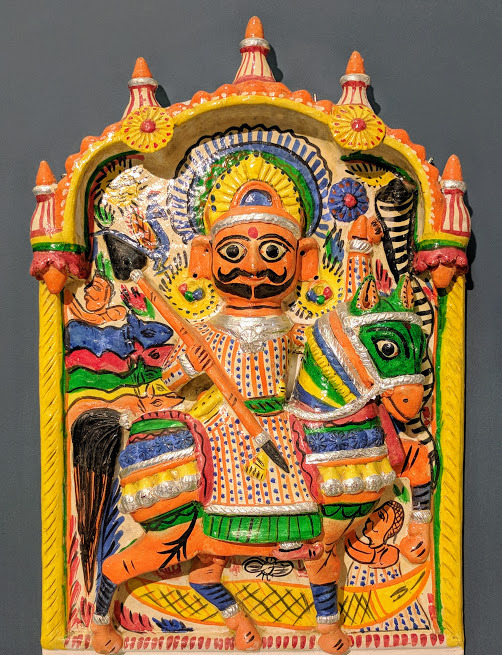 I wonder at the interest in and revival of, if it can be called that, Indian ceramic and clay art and wonder if the Mutable Exhibition is the first of many events and programmes planned this in the country. 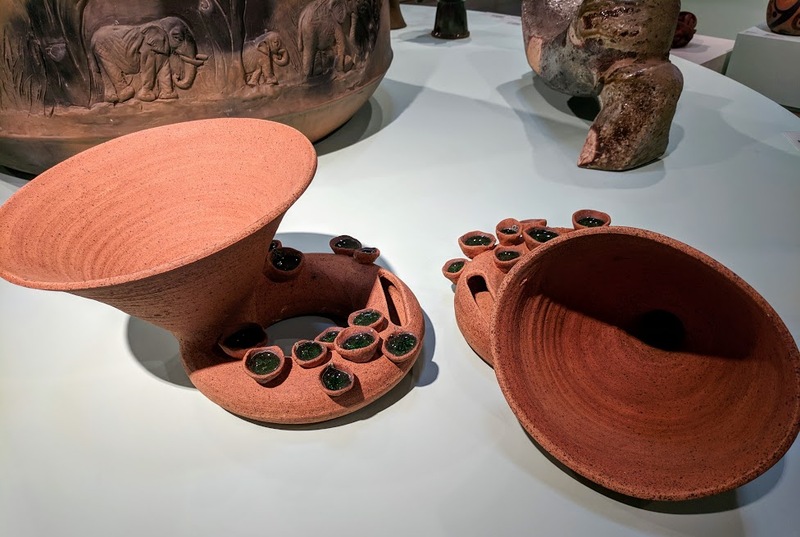 I wonder why the importance given to pottery by archaeologists and historians no longer appears to be there with contemporary work being taken for granted by a large majority, which includes me as well. I’m definitely one of those who has taken clay and ceramic art for granted. But this was not always the case. When I started working in 1993 and also started travelling to various places, apart from books, I bought clay and ceramic art — for use at home, as souvenirs, as gifts, etc. My first ceramic piece was a blue and white vase that I got at an exhibition; my first clay art was a terracotta elephant from Chennai. I still have both of them ! 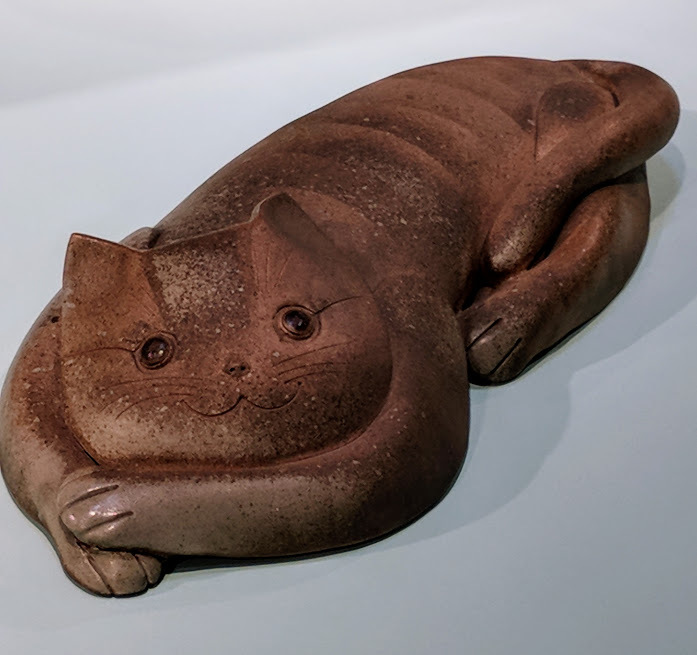 When I reached home after visiting the Mutable Exhibition, the first thing I did was to I look around and see the ceramic and clay art at home. Within minutes, I had assembled this little ensemble (you see in the photograph below) together. Though there were more, I didn’t have the patience to gather them together and thought that this was a representative enough. The oldest in this lot is from December 1993 and the newest is from October 2017 and have come various places like Kolkata, Puducherry, Chennai, Delhi, Jaipur, etc. A small selection of ceramic and clay art from my home. The blue pot, my first ceramic art, is in the centre and the terracotta elephant (extreme left), a travel souvenir, was my first clay art. I’m sure there are many like me who have collected and use ceramic and clay art in its various forms. While such people may not and cannot be termed as collectors in the strictest sense —perhaps patron is a better word? — they are important too. For we too have been a part of the changes sweeping through the world of ceramic and clay art in India. And we too have recorded the changes with our little collectibles. Would you agree with me? As part of the “Mutable” Exhibition, various events and talks were held at the Piramal Museum of Art. While I had the noble intention of attending at least some of them and interact with the artists, and perhaps even visit the exhibition again, that didn’t happen. As the Museum draws to a close next week, I’m just happy that I managed to visit it. If you are in Mumbai and haven’t visited the exhibition yet, this weekend is your last chance to do so. Please, please don’t miss visiting the Mutable Exhibition. And if you go or have already visited the exhibition, do let me know what you thought of the exhibition. PS: I received the very timely Marg Magazine on “Indian Ceramics: History and Practice”, yesterday evening, but am yet to read it. Hopefully, it will answer a lot of my questions. “Mutable: Ceramic and Clay Art in India since 1947” is on view till 15 January 2018 at the Piramal Museum of Art, B Wing, Piramal Tower, Peninsular Corporate Park, Lower Parel West, Mumbai 400013. Beautiful, colorful art pieces carved and the Sulahi is so beautifully. Of course, the images are adorned by the aesthetic writing.